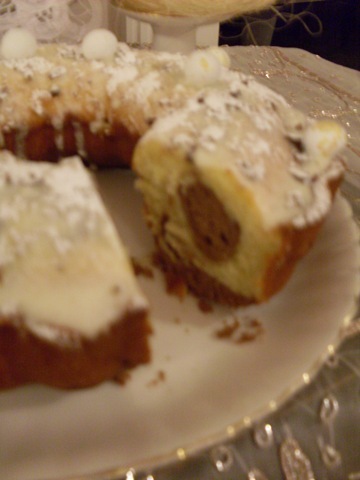 A combination of vanilla and chocolate S W I R L E D together to make a marbled effect. Oh, and be prepared for a few extra bowls to wash up. This cake is exhausting! 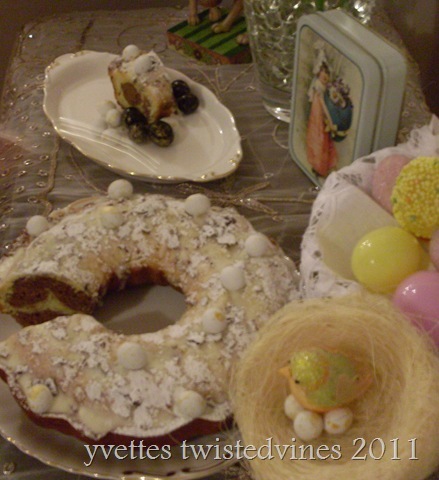 Don’t get me wrong its a wonderfully delicious and moist cake, but it takes a little longer starting from scratch! But, of course all the more fun, when taking a knife, cutting a slice and seeing exactly what patterned you’ve made. 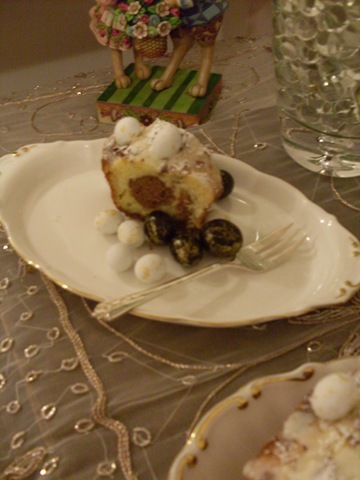 So, yes this cake is alot of work, but everyone enjoyed it and really it’s a wonderful dessert for any occasion. 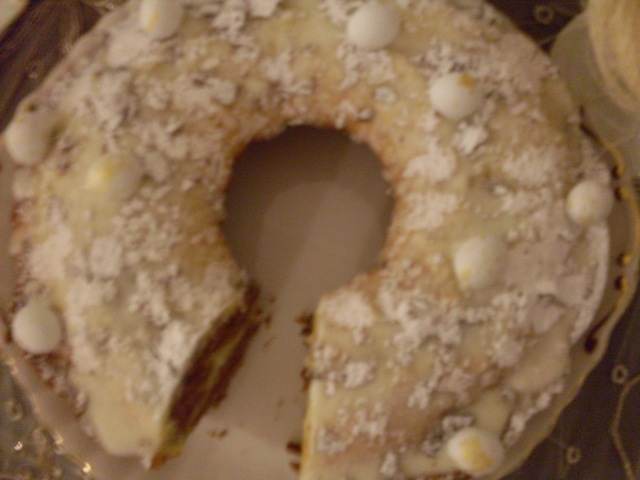 I decorated this cake with a creamy frosting covered in icing sugar and mint chocolate Easter eggs. Firstly sift and combine flour, salt, baking powder and baking soda together in a bowl and set aside. In another bowl, cream butter and sugar until light and fluffy. Add vanilla and egg and beat until well combined. In another bowl, beat egg whites until stiff forming peaks. 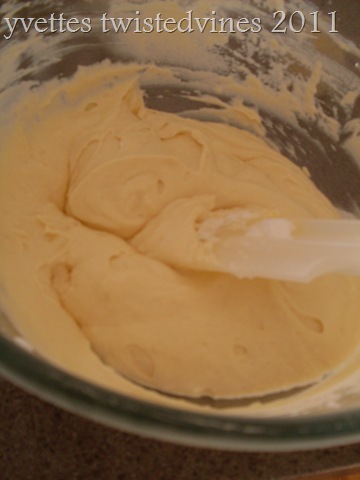 Add the 1/2 vanilla yoghurt, then gently fold through the 1/2 egg whites, until well combined….Vanilla mixture. Add gently and gradually 1/2 flour mixture, then add the other half of the yoghurt. Melt 120g chocolate in a saucepan, over very low heat. 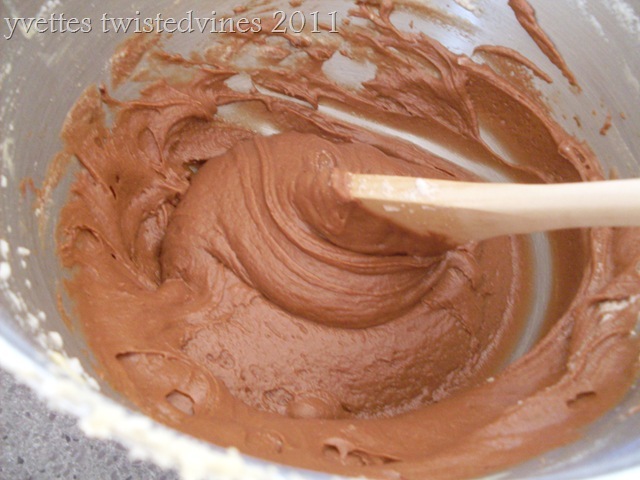 Fold gently egg whites into this mixture until well combined..chocolate mixture. 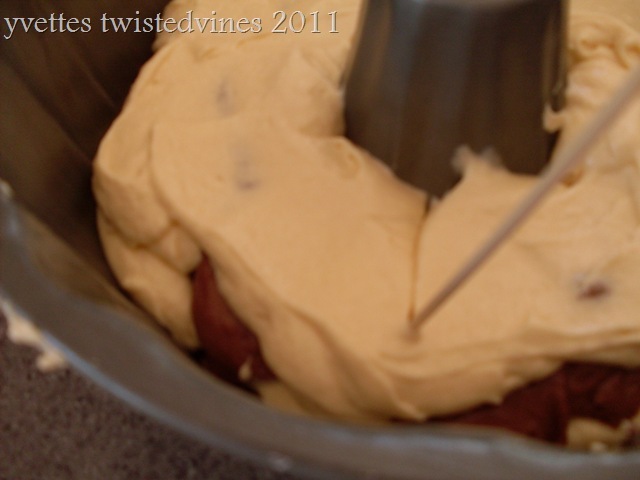 Now for the fun bit, layer each mixture into the bundt cake tin. 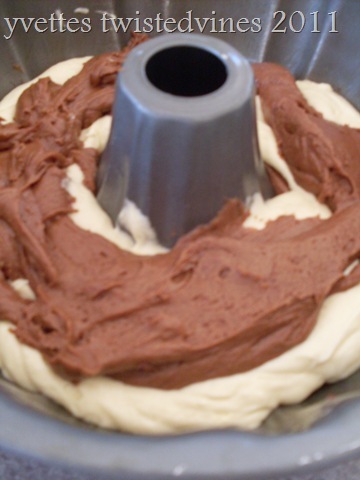 With a skewer draw circles or lines through the mixture. 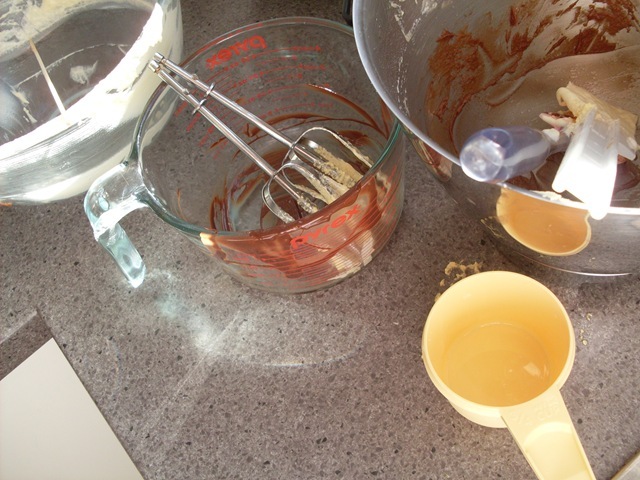 Bake cake in preheated oven for 40-45 minutes, or until a cake skewer inserted in centre comes out clean. Remove cake, cool and then flip onto cake rack. 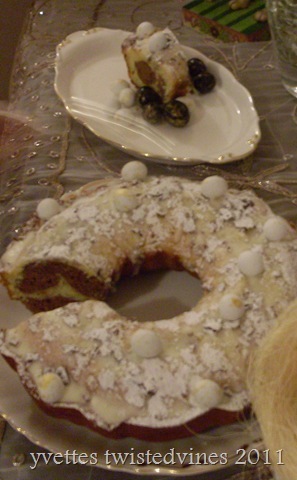 But of course,a fun cake to make, and a surprise when you slice it. 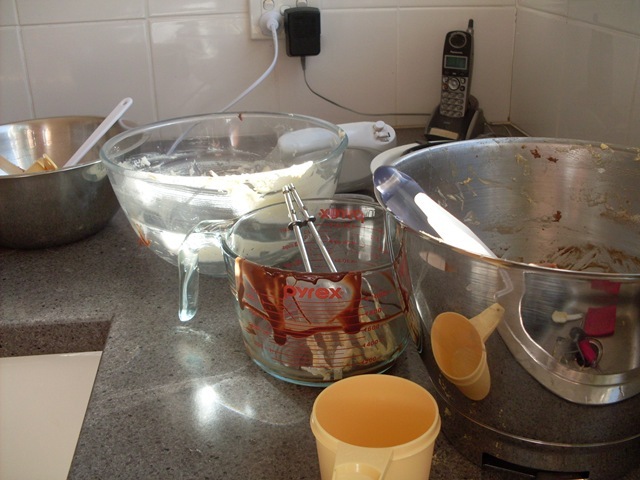 Definitely worth the mess Yvette, your cake looks lovely.